I have to admit, I sometimes eat like a horse! Anybody out there? Well, with a crawler at home, life sometimes can be busy that I do not have the time to eat. When the in-laws suggested that Mr and myself go out for dinner while they look after Grace, I took up the offer and found Mundo Churrasco. This restaurant specialises in Brazilian Barbeque and it is sort of like a buffet, but served personally to each of the tables carrying a big skewer of meat and carved in front of you to your personal plates. It was certainly interesting and new for us. 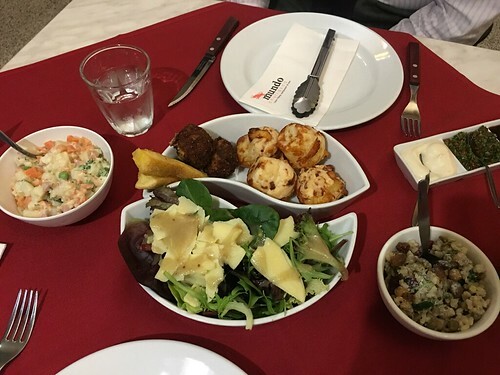 Firstly we were given some sides that include garden salad, Brazilian potato salad, four grain salad, Brazilian cheese bread and cassava chips. I thought they were all right. The potato salad and four grain salad certainly tasted better than they looked. It was our first time trying out cheese bread and it was quite good. Once that is done, we were served with lots of selection of meat skewers and since we were the first table served, we usually get the outermost layer of the meat, which could be good and bad. I sometimes found the seasoning to be too salty. The waiter was happy for us to request carvings from other section (inner part) of the meat, which tend to be more tender and less dry. We tried so many different kind of meats of beef, chicken, lamb, chorizo and even kangaroo meat. My most memorable one was the chicken heart which I could not swallow and Mr seemed to enjoy it so much! There was also the occasional vegetables such as roasted vegetables (broccoli and cauliflower) and finally for dessert, the much awaited crumbed bananas and the spiced caramelised pineapples (not a fan because it was not sweet).